Installation at the Korean Cultural Center, Washington, D.C.
Curtain Room (2018) focuses on the dual aspects of urban space, where the definition of space, standard, and order, which is proposed and constructed by a society, is easily forgotten, invaded, distorted, and removed. Curtain Room is built in a circular form, which is suspended from the ceiling and covered with ivory curtains. Inside the space of the curtain, a wooden chair is placed on a wheeled steel structure, so that the viewers can see the lower half of the chair. 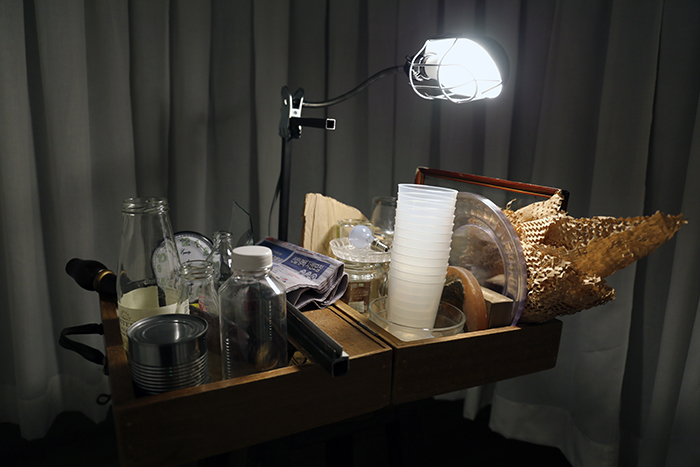 On the invisible upper side of the chair, various found objects are installed, such as glass cups, a plant, a broken glass and a broken chair leg, which were collected from empty or removed spaces in South Korea. With a dim light, shadows of the objects and living noises spread though and beyond the space of the curtain room to make an imaginary space. This room creates forced openness.